Heavily featured in touristic brochures for a good reason, Japan fascinates visitors with its blend of traditional and modern culture. Whilst its inhabitants maintain its deeply rooted cultural traditions, its modern infrastructures and achievements display its acceptance of globalization. If visiting the country, you should make the journey to Tokyo – an electric city with a sparkling cityscape and bustling atmosphere. Kyoto, a former imperial capital, will offer a more peaceful atmosphere and is characterized by its arts, geishas and ikebana that shape the strong identity of the city. For those seeking a cultural experience, make sure you do not miss the city of Kamakura perched in the mountains, which will delight visitors. 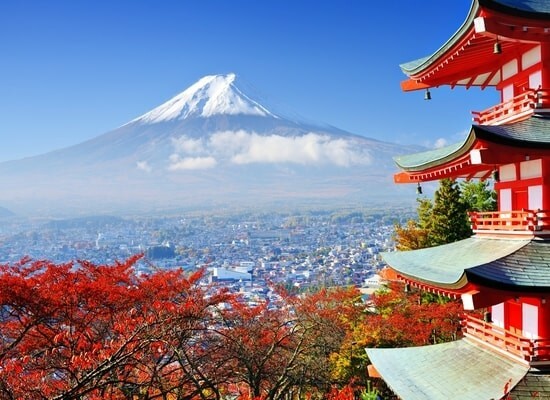 Finally, a trip to Japan would not be complete without seeing the gorgeous Mount Fuji, both a national emblem and a pilgrimage site. Japan will not fail to impress with its colourful sights and activities. Last Updated: March 14, 2019 16:08 ESTThe Health tab was updated - travel health information (Public Health Agency of Canada). Japan provides excellent medical care to its inhabitants in line with international standards. Whilst reputed for its state-of-the-art medical equipment and infrastructure, these benefits come at a cost, and english-speaking doctors are rare. Foreigners with long-term visas are not entitled to the health insurance which founds the Japanese health system. For this reason, purchasing travel insurance before arrival is highly recommended. Centers specialising in psychiatric care are rare and limited to urban areas, and foreigners will find it difficult to access these services. Also, note that inhalers and stimulant drugs are prohibited in Japan. If you need to bring specific medications on your trip, ensure to bring a prescription with you to avoid confiscation. If you need to bring a large number of drugs or syringes into the country, you will need to fill out a customs declaration in advance. Moreover, be aware that medications for depression and attention deficit disorder cannot be accessed in Japan. The number to call in the event of an emergency is 119. Is Japan Safe for Travel? Only a passport is required to enter Japan for tourism trips under 90 days. The passport must be valid for the length of the stay. More extended stays, as well as business and student trips, require a visa. Note that if you have already entered Japan as a visitor, you cannot apply for a visa. Overstaying the 90 days tourist visa-free is a violation of federal laws. Currency over 1,000,000 Japanese yens must also be declared during entry and exit.